Most leaders earn their ranks by being feared, respected, or loved. Great white sharks have a knack for inspiring all three. If you’re looking to model out the ideal characteristics of a top marketing leader, why not look to one of nature’s top predators? 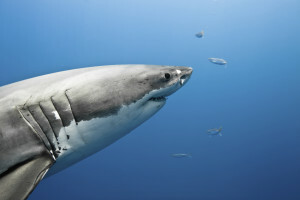 In honor of Shark Week, we’re bringing you six fin-tastic tidbits about the great white that can add bite to any CMO’s efforts. Forget the lone hunter image of great whites, and while you’re at it, forget the solitary executive image you might have of a CMO. Great whites are actually known to have shared territories, and even distinct packs with organized social structures. Sure, the biggest great whites often get first bites when it comes to a meal, but based on their behaviors, they seem to know how much to take for themselves, and how much to leave for the next in line. Likewise, effective CMOs have a knack for supporting and maintaining the social and professional relationships around them with an equal eye for give and take. A pack of peers, colleagues, and influencers who are big fish in their own rights, but who swim well together – think of someone who can make an all-star conference panel happen on a whim. A school of up-and coming marketers who can feed off of the CMO’s best practices – often your Millennial marketers who are moving up the chain. Great whites need to keep moving to force water over their gills to essentially breathe underwater. It sounds like a bit of a disadvantage – who wouldn’t want to just stop and float for a minute – but when you’re an apex predator, you’re all about moving forward. Similarly, today’s top CMOs can’t move backward either – not only because the rate of change in marketing is faster than ever, but also because these leaders have an eye for continuous improvement. They’re always looking to take their marketing efforts up another level. Great Whites Have Killer First Impressions – Literally! Great white sharks catch their favorite prey item, seals and sea lions, by striking from below – seemingly out of nowhere – with immense force, at times, even leaping out of the water. This impact is often instantaneously fatal or incapacitating to its prey, and allows the shark to more easily consume its food on its second pass. Effective CMOs must have an equally impressive skill for first impressions as today’s buyers have smaller attention spans and bigger expectations than ever. These leaders know the first hit may not be where the deal is won, but a good start makes the rest of the process a lot more seamless. It’s no secret that great whites have impressive jaws – the name escapes me, but I believe someone made a film about it in the 70s. What you may not know, though, is like all sharks, the great white’s pearly whites are replaceable. If one bad bite causes a tooth to fall out or get lodged in its prey, a great white sill has rows of teeth behind it to fill the gap. Similarly, along with their front line of campaigns, concepts and strategies, savvy CMOs have rows of backups and alternatives lined up in reserve. In the churning world of modern marketing, effective CMOs plan and prepare to fail, take losses, or lose a few teeth (metaphorically speaking), so that they can turn those lessons into even sharper insights and initiatives. Market research shows that 100% of marketers – yep, that’s all marketers – use at least two or more channels to engage their buyers and customers. In a sense, great whites fit this pattern too as their physical colors function across two channels, namely for sea creatures swimming above the sharks and for sea creatures swimming below. From above, the great white’s dark blue coloration makes it nearly invisible to its prey. From below, its namesake white belly mirrors the light color of water near the surface; again, making the shark hard to see for prey or even other predators. Similarly, effective CMOs actively align their efforts to be relative to their given communication channels. Given their heightened senses, sharks are bombarded by a wealth of data and stimuli every day, and great whites, in particular, are especially good at using this data to their advantage. From spitting out seal decoys used by scientists to draw them in, to vacating areas where orcas (killer whales) have killed other sharks – it does happen – great whites have shown biological systems of discernment. Whether it’s simply involuntary instinct, or even if there’s some thought involved, great whites take the data they’re given and react to it accordingly. CMOs, hopefully, can give their data more thought, but like great whites, they need to have systems for what to do with that data – move on to the next thing if something doesn’t smell right, or attack if all signs look good, for example. Of course, you don’t want a literal great white shark patrolling your board room (or do you? ), but hopefully, the tips outlined in this post will give you something to sink your teeth into. Whether you want to dive in with your own insights, or you want to call bull shark on anything noted above, please feel free to keep this conversation going in the comments below.